When you wake up in the morning looking like a zombie, you can count on these products to banish the dark, dark bags under your eyes. Before you know it you will be looking bright eyed and bushy tailed. Hydration is key to making the eyes look less puffy. I adore the Origins Eye Doctor, its super moisturising but doesn’t unsettle makeup you apply over the top. Tap this in using your ring finger to get rid of the collected fluid around the orbital bone. The Urban Day Naked Concealer has a handy doe foot applicator, so I just do a quick swipe under each eye. My favourite way to blend is with a damp Beauty Blender, it leaves a seamless finish. 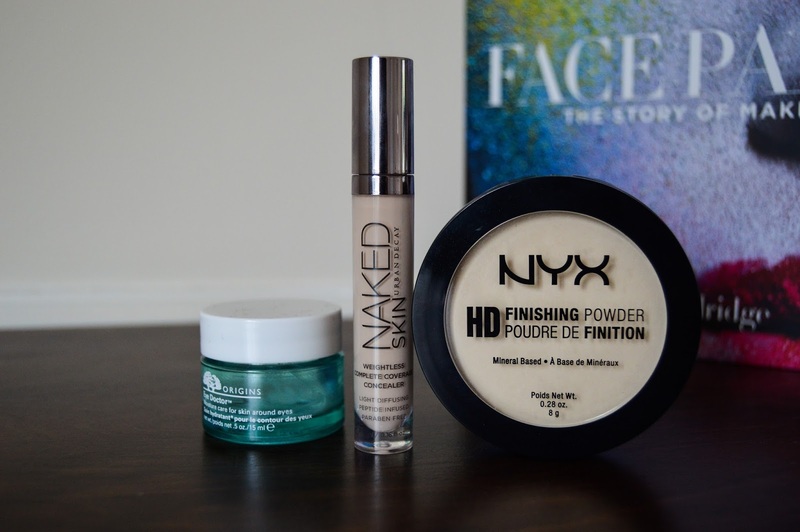 A recent addition to my collection, the NYX Banana Powder has quickly become a favourite. It’s super finely milled and feels weightless on the skin. I sweep this under the eyes to set the concealer and brighten the area further. Don’t worry the yellow hue in the pan doesn’t transfer onto the skin, it’s translucent. Now that the dark circles are disguised, you look less like a zombie and more like yourself!